UnCrushed Leaves | "the untold"
It grew colder with every kilometer we covered; we were definitely ascending. The jagged cliffs were intimidating, the deep ravines forbidding, the broken road daunting. At altitudes over 13,000 ft, the sun rays are of a piercing quality that goes right through the skin and one can feel the burn. Riding through this unreal, moon-like landscape – Thrilled or Scared? On days such as this however, when the clouds are playing hide & seek; the sunburn alternates with the innate cold of the high Himalayas. That unadulterated cold that radiates from glacial fields and the towering heights of snow-capped peaks; that of the shivering, bone-chilling, teeth-rattling demeanor. Riding up the steep road from Kaza was proving to be tough. To stay on track required quite a bit of concentration. The bewitching sights weren’t helping much either. Abruptly, the jagged cliffs end. We arrive at an unexpectedly open tableau: large meadows painted with shallow hills, patches of green where a sporadic stream would pass through. Cold, but eyes wide in wonder, we amble through these little mounds and are suddenly heralded! A look around and we see the slim figure of a woman waving to us. Clad in a red kurta, chunni wrapped around her head she gives us a ‘come hither’ nod. Curiously, we turned back. Peering around the bend we arrive at a group of people sitting together in a culvert. They were gathered around a makeshift stove, chai steaming away. Lo and behold! It’s a picnic at 4400 mts! With enthusiasm we abandoned our bike and joined the circle. Cradling the piping-hot tea in our frozen hands, our gratitude knew no bounds. A polite exchange of queries got us settled in. This cluster of people; couple of old men, couple of young women and an assorted age-group of village ladies; had taken a break from their daily work in the fields and got together in the afternoon for chai. The aunties were chatty and asked a lot of questions; in response to most of which they remarked among themselves and laughed playfully. The girls were polite and industrious. They handed us some Spitian roti (baked, fluffy & pita-like bread) and were passing around a jar of homemade pickle. One of the uncles had a loud sense of humor; he made fun of “all the fancy young men strapped in helmets and alien jackets” who rode along on their motorcycles. He figured they wouldn’t be tough enough for these mountains. Another old uncle was constantly twiddling around with something black and stringy in his hands. Upon inquiry, he told us (actually translated via the young ladies) that those were balls of ‘Yak-wool’. He was spinning it into thread which he would braid in to rope. Yak hair is commonly used to make warm clothing, rugs and blankets too. We gratefully sipped on the simmering chai, shared some laughs and bid adieu to this lively bunch who welcomed us to their corner of the world with such warmth. But not before they told us to go look for fossils in Langtza! The local boy Chhaperam, would have never thought of running a marathon in his backyard and competing with international runners and a contingent from the Indian army. Little did he know, that he would be sliver medalist in the 10km men’s category of the UnCrushedLeaves Himalayan Marathon held in Jibhi on 20 May, 2018. This was unprecedented in Jibhi and excitement among locals was palpable for the event. The marathon was organized by UnCrushedLeaves, a travel experience outfit. Early morning on the 20th of May, the marathon was flagged off for 21kms, 10kms and 5kms. The half marathon that went up on the Seraj-Banjar range with picturesque curving roads, pine trees by the side, offered runners the challenge to gain 944 meters in elevation. The army man, Hemant, from J&K Rifles won the 21km category with a time of 1hr 18m 14s; he was followed by Peter Mwangi, a participant from Kenya with a timing of 1hr 20m 13s. The local girl, Prema Devi, was the winner in the women half marathon category with a timing of 1hr 54m 01s. Mr. Surendra Shourie, MLA from Banjar constituency and chief guest for the awards ceremony, appreciated the event and said that there are new projects being implemented in the valley which shall further boost tourism. The Himalayan Marathon was sponsored by Decathlon, Fast & UP and TimesCard. It was supported by JVTDA whose president Bhawan S. Rana said that course was challenging for runners, which makes the UnCrushedLeaves Himalayan Marathon unique. He added that such events shall shape tourism in the valley and JVTDA is happy to be part of this event. Local flavor was another welcome twist for the marathon. During the event traditional instruments and musicians were used to motivate the runners and after the marathon they were treated to a round of delicious Himachali cuisine. The founder of UnCrushedLeaves, Kunnal Sharma, said that concept of Himalayan Marathon is to promote healthy living and Eco-tourism. He emphasized that future marathons shall further amplify this cause and provide increasing degree of challenge to runners. UnCrushedLeaves is travel experience outfit based out Thane, near the Mumbai Metropolitan region. For over past two years, travelers have experienced different parts of India with UnCrushedLeaves and it has a growing tribe of over 28,000 followers on Facebook and 17,000 followers on its blog. It’s early morning; you open your eyes to a misty river flowing down a hilly valley. You doze off again. You’re sliding atop this river on a magic carpet, your hand skimming the water. You’re licking on a candy cone that tastes like coffee foam. Slowly, through the fog of lucid dreams you realize, there is no river. This massive river of mist is cascading down in between skyscraping peaks. The sun rises up behind these hills and starts to illuminate the undulating landscape. Wayanad is green! Doesn’t matter if the overnight train journey to Calicut (or Kozhikode as it’s been rechristened) was a little noisy; this is India after all. The crisp morning has woken us up and we’ve stopped on the kerb to gape at the hills. Our expectations of the next few days have risen. We’re at Lakkidi, a way-point on the three-hour road to Wayanad from Calicut. The road takes an appalling nine bends to make a steep ascent. These curves have been a mysterious prelude where new sights have appeared. Let’s see what comes next. The hidden valley of Banjar, the gorgeous village of Jibhi, the loving people in it’s homes. The spirit of this place is fresh and lively. The hard work and honesty embedded in them is inspiring to see. The modesty and kindness comes from the land itself. The calm yet playful river of Jibhi embodies its soul. Jibhi is a homely jewel in the midst of spectacular beauty. Cached in between the eminent valleys of Kullu, Simla and Tirthan this village feels like family. Banjar might be the market and Jalori Pass the pretty crown, but Jibhi is the bond that represents its values. It offers the comforts of your own roost. It’s cozy. The people are simple and welcoming. They smile at you and will even come say hello; probably invite you to stay at their guest house or a neighbor’s. The Sainj-Aut road curves through the tiny market. A little river, scarcely more than a stream, flows through the center of this valley and Jibhi is spread out on the slopes on either side. There is even a summer angling competition where you can catch mountain trout. But it is a catch & release policy. There are homestays, guest houses and even cottages alongside the rivulet. You can just step out in the afternoon and drop yourself into one of the eddies. The way across, is to walk a wooden plank laid upon rocks in the water. It’s fun! The innovation of the people shows through in how they’ve adapted their houses to welcome travelers and stay in tune with the nature around them. There is also the Gadagushaini road which crosses over the rivulet and climbs up to the villages on the peak. This unpaved path strings up to a ridge from where snow caps are visible. There is a lotus pond up near the village of Bahu where dogs play tag and run into the muddy pond to cool off. Over seven kinds of plums and peaches are what we found with roadside basket sellers; and the mouth-watering juicy kind! The fruits and flowers in summer are resplendent and give an aroma to the breeze. It is worthwhile to try the local squash, leafy greens and ‘Lingri’ (fern) pickle. At Rana Uncle’s guest house one can even find homemade multi-grain bread. They have a clay oven which was setup with the help of traveling guests. Organic farming and volunteering brings the conscious tourist here. It builds an atmosphere of bonhomie and mutual admiration. The visitor and the local see each other as peers. If you’re ever in need of assistance, from booking an emergency cab to just borrowing a fishing rod, all doors are open. As you ascend from Reckong Peo, it becomes greener; the air is cooler, the woods turn deeper and prettier. The pine trees surround you and cast their scent in your path. The winding road lets you catch glimpses of the big fat mountains on the horizon. Kalpa is a village set amidst orchards; we mean the apples might be reaching in through your bedroom window. A lot of the houses and guest houses are set in the fruit groves. When the season is ripe, a gust of mountain breeze will drop the apricots on to your head. The trees by the side of the road are usually picked clean; you know, passers-by! Don’t steal! But you’re very welcome to ask the local folk for fruit; they’ll gladly let you sample, even point out the particularly delicious ones. Where there aren’t orchards, there are pine trees. So you see that this place is very green! Also you understand that apples, apricots, peaches, plums and fruit in general is the cash crop and means of livelihood over here. And it has brought prosperity and wealth to the people of this village. So much so that many guest houses are sprouting up here. It is beautiful to see how the whole ecosystem comes together for this lifestyle to flourish. The fertile slopes of the Himalayas fed by glacial streams channeled through the fields; the birds and bees pollinating the trees; the lizards and rodents watching over the insects; the livestock putting in hard work; the human beings with their organization; the worms and microbes replenishing the soil; all of it to produce the fruits of labor, quite literally. We came across a large boiling vat throwing off fruity aroma by the bucketful. Upon enquiry we were told that a local liquor ‘Arra’ was being made. It is brewed with Chulli (local name for apricot), apple and some local herbs. The mixture is fermented in earthen pots for a few days and then put to boil. It is a proper distillation process where the steam coming out of the vat is directed in to another vessel via a pipe. When cooled, it has a clear water-like color and texture. And it’s available at the village market for cheap. The first time I saw the name Reckong Peo on a map of Himachal Pradesh, it held my attention. It seemed like a land so far off in a corner of the world, that god knows how one would get there. It seemed mysterious. I conjured up an image of a dusty frontier town with a token government office and a little market for the villages in Kinnaur. One of those towns from the stories and legends of the Silk Road. When one is roughing it out on the dusty parts of the Hindustan-Tibet road, with the mighty Sutlej running deep on one side, and one sees the road-sign pointing to ‘Peo’ (yes, the town has a nickname! ); one wouldn’t expect what’s coming. As we climb, the dusty valley floor turns to bush and shrub, lush greens and coniferous pines within three turns. Each hairpin teases us a little more; there seems to be something opening up on the hills across the valley. Then, suddenly you catch a glimpse of white! It is the snow-line! The dizzying heights of permanent snow! In open-mouthed gaping wonder we strain our necks to see more and more of this. Whilst we’re so occupied, we arrive smack in the middle of Peo market. Suddenly there are scores of shops, many vehicles and even traffic cops! Dazed for a moment, we stand in the middle of the square blocking traffic. A sharp whistle and gestures from the cop get us moving and we park to the side. So this is the district headquarters of Kinnaur, Reckong Peo. I was right in one sense, it is the market and trading place of the region. What I did not expect was modernization. Concrete has come and brought some of its monotony here; sort of a small town mall and shopping complexes that you’d find in urban India; plenty of government offices and buildings. But, this is where you resupply! And we’re thankful for the mechanics, fuel station, batteries, hardware shops, ropes and fried food. We all have questions. The answer to which do you seek? A piece of cloth belonging to the Mummy has been carbon-dated to about 550 years ago. Unlike the common perception of a chemically treated, bandage wrapped sarcophagus, this one is sitting in an upright pose. This indicates a voluntary meditative practice. The mummy itself is a wonder to behold. Sitting upright, the chin is resting on the knee. An arm coming out from between the tucked legs is held in a pensive manner. The head is held straight and the face looks ahead; whether it’s right at you or beyond to infinity, is something that your beliefs will tell you. “Do you know where you are? These are the frozen dry lands of Spiti. In the extreme cold, buried under soil and rock, the Mummy might’ve been protected from bacteria and other decomposition microbes. Moisture and oxygen, essential to decay, probably didn’t get to it. The uncharacteristic black soil of the surrounding mountains may contain minerals with preservation capabilities. There is such a high concentration of silt in the water that it turns milky white glacial streams in to a black river. These theories might require confirmation by chemical testing, but they’re grounded in me. I’m Science in this daydream, remember? “, he smiles. “Do you know where you are? 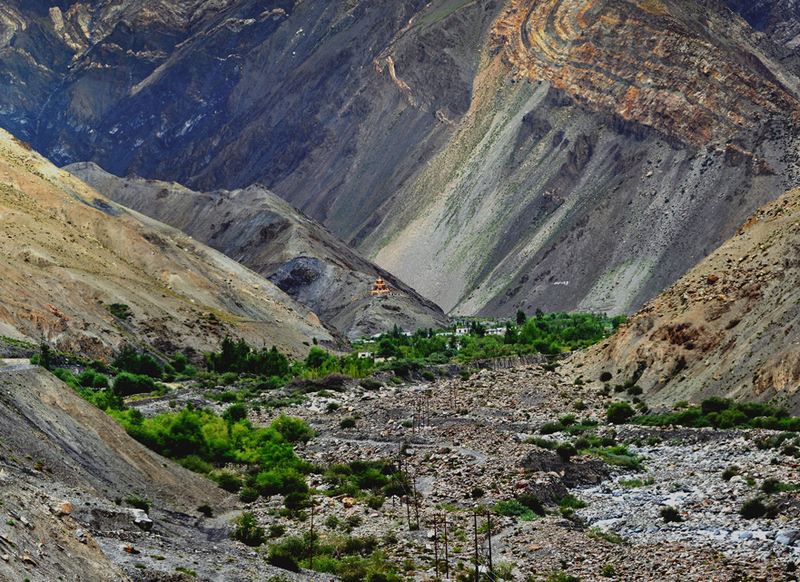 These are the magical lands of Spiti. What gives this place life? The will to be, the perseverance to do and the belief in good. It is Nature that keeps checks and balances. If the vices of the world had come to breed here and engulf this place so close to it, then Nature must’ve sent forth its insight and energy to stop them. What better way to manifest than in the form of man. The very creature which personifies this conflict of good and evil. “Do you know where you are? These are the frozen magic midlands of Spiti. The land that lies between India and Tibet, the origin and the epicenter; Buddhism straddles across this valley. The battle of logic and belief, of Science and Spirituality is merely that of fact and faith. They are the parallel rivers of man and nature, they live together and shape each other. One unfulfilled without the other. They are the balance of yin and yang. The balance of being, the balance of Nature. The severe exterior combined with the humility in his posture reflects how nurturing care can be wrapped in resolute determination. To stare into the hollow eyes of one who would accept the burden of his fellows and devote his existence to their well-being, is an awe-inspiring experience. I see the mountains, I see the snow… I see myself and I see you. The fable goes that with commerce and prosperity came greed and dishonesty. The peoples’ faith shifted from the virtues of caring and piety to vain, individual benefit. As the community suffered, so did the land; torrential downpours followed dry years and caused landslides. Man continued to not learn from his doings and Nature sent a plague of scorpions. Infested, the village wasted away and the people lay sick. A benevolent lama decided to take on the years of neglect and misdeeds upon himself. Word is that he sat down to meditate and cleanse the land. In doing so, he gave himself up to the divine nature and left his body. A rainbow appeared over the valley and the scorpions disappeared. The story and lama were lost over time. From folklore and the foggy memories of the elderly, he was identified as Tulku Sangaa Tenzin (translation: His Holiness the Enlightened Tenzin). The village has taken care of him since. In 2006, the state government of Himachal Pradesh took an interest and started construction of the shrine that now houses it. A traditional-styled temple with modern construction methods is being built and word is that soon a gompa (monastery) will be attached to it. Welcome to the Mummy Road!!! The parallel rivers of man and nature, they live together and shape each other. One unfulfilled without the other. These intertwined paths lead us in to a valley formed by the black river Gue. The mysterious waters have gathered over centuries from glaciers and underground streams. At the edge of their world, they were shielded from the stark austerity of the Spiti Valley. But as all juveniles aspire, they cut through the mountains that sheltered them. 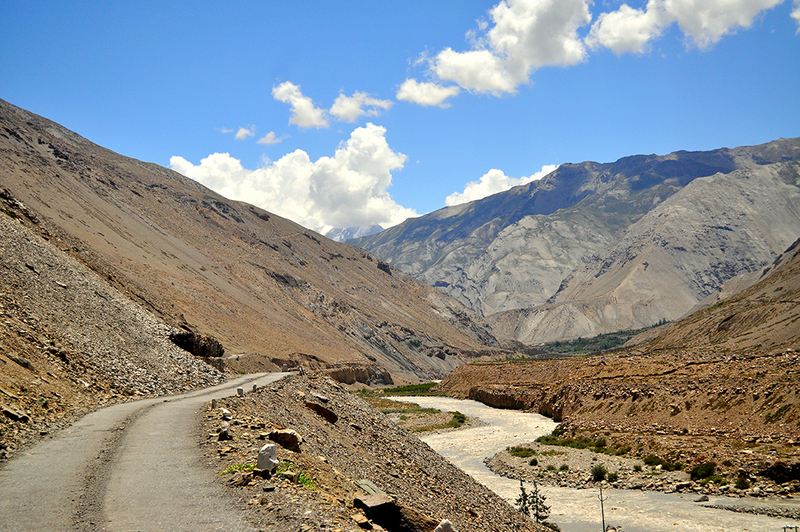 They made a dark narrow path that must run deep and turbulent through to the mighty river Spiti. In this valley, at the foot of a massive mountain, lies the tranquil village of Gue. The people have guided these waters to spread through the village and irrigate their fields of peas, herbs and flowers. It runs through their houses and taps. They smile at each other and share duties as a community. For a 10 day period, each family is made responsible for communal tasks such as grazing the cattle, mending the water canals, tending to the crops, cleaning the streets etc. The Mummy-of-Gue sits on a hilltop and oversees the well-being of this village. The residents collectively take care of the shrine dedicated to him. It is now being made in to a monastery. Traditionally known as Ghiu, this place hasn’t always been so gentle. Like the cyclical nature of time, this hamlet had its dark days once. Just as its river had carved through to the outside world, its people had reached out and traded. 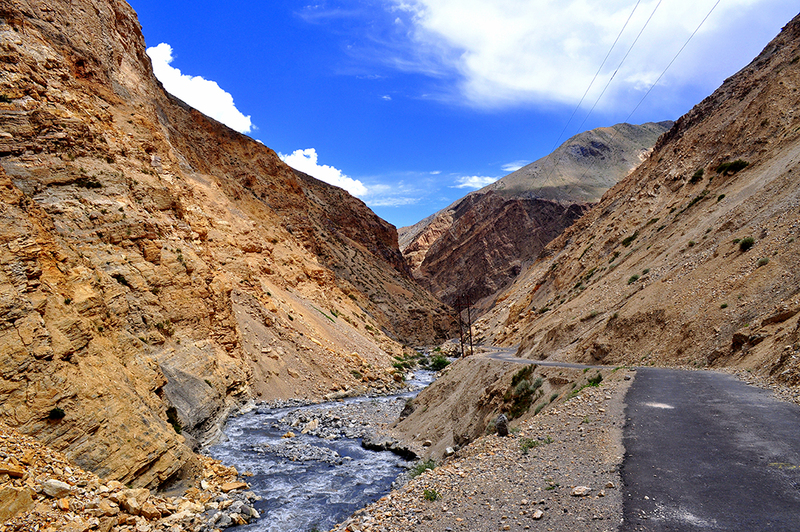 It became a via-point for the lamas of Tibet to rest on their way to Spiti. Currently only 4kms away from the Chinese border as the Himalayan raven flies, it is a meticulously guarded village. The seat of the Mummy!